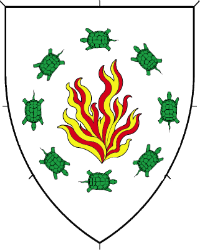 Argent, a flame proper within eight tortoises in annulo, sinister limbs to center, vert. Name registered with the College of Arms in October 2017. Device registered with the College of Arms in November 2017.